I was gutted when the maker of Harajuku Lovers, Gwen Stefani, stopped making any new perfumes. I was so upset, but noticed that a lot of previous collections were hitting the discount stores - and still are. I keep finding these in TKmaxx and other shops alike, and these babies are all over the internet. Places such as Fragrance Direct and Cheap Smells have a load of Harajuku perfumes and they keep changing which ones they're stocking - So keep an eye out! Also check out Ebay, these are everywhere. I wanted to share the ones I have and talk a bit about them so you get more of an idea what each perfume is like. I don't have the whole collection, but I have a fair few! 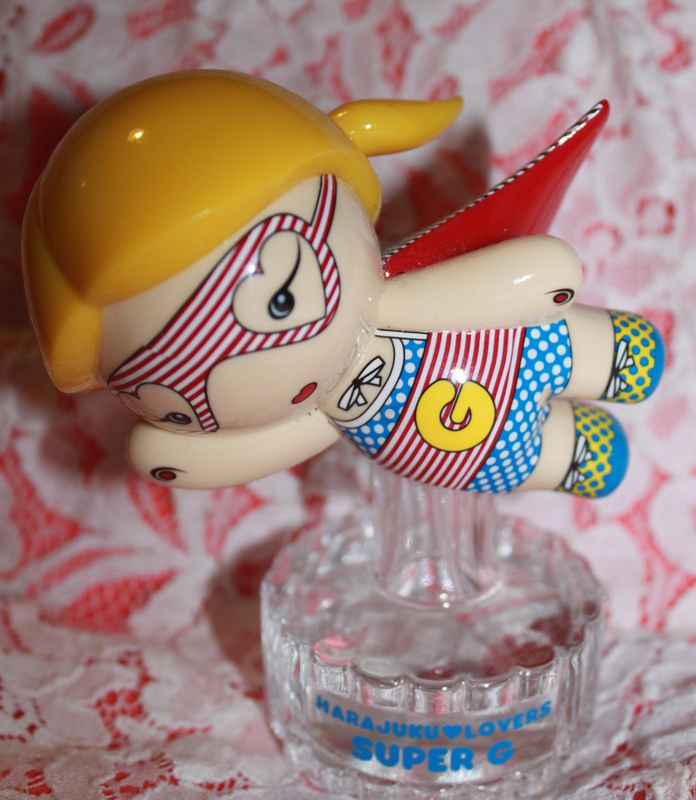 Super G is a Limited Edition perfume which you can still find on Ebay. This is one of my favourites, it looks so funky and arty. The smell of this is without a doubt fruity. The two most distinctive smells in this perfume is coconut and pineapple - It smells like an amazing sweet cocktail! If you like your perfumes fresh, summery and fruity, this is one I advise you get. This may actually be a favourite of mine. G of the Sea is another Limited Edition perfume, and by what I remember it was only out a few months on the shelves. However you can still pick this up on Ebay. This is a very sophisticated smell in a gorgeous bottle. 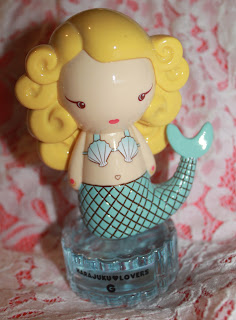 I love how the perfume is also blue to match the pretty mermaid. The perfume has more of a woody floral scent. It's so delicate and really reminds me of something that I can't quite put my finger on. This is simply stunning, and smells divine A very lady like smell indeed. I can really smell the water lily in this, and the undertones of red apple too. The only down side I have is that it doesn't last long, which is such a shame for something so pretty. This is one for the more classy. Love Wicked Style is one of my most recent ones to the collection. 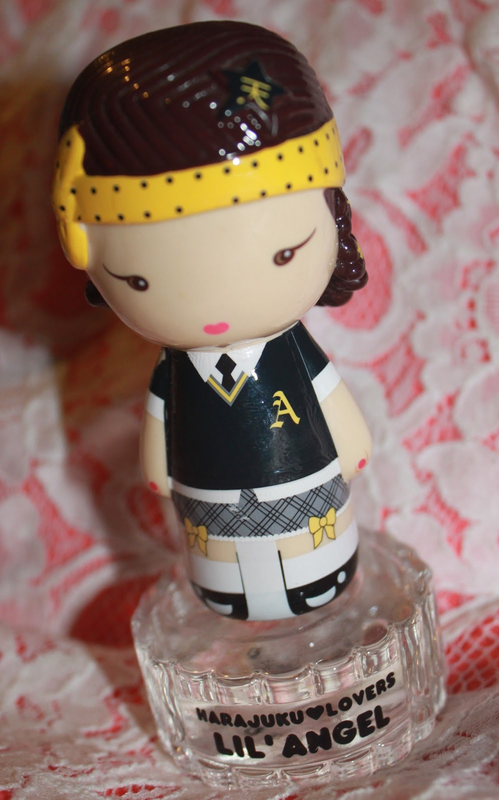 It's velvet hair and matching purple perfume looks a treat on my shelf. This is more of a powdery scent with a subtle fruity smell. I love this one. I really think this smells like a combination of grapes, parma violets and powder, but there's none of these in the perfume! This perfume is laced with Pear, Sandalwood and Praline, this really is unique. I think this is the most sweetest of the lot and that's what I love. 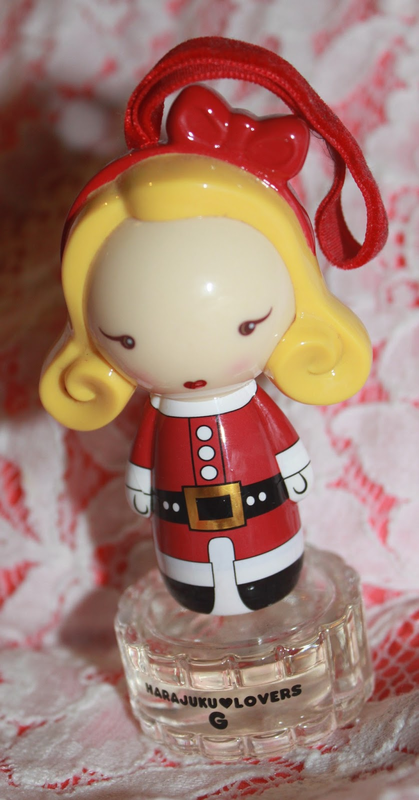 Lil' Angel was the first one I ever got, and I was so happy to get it. This is another fruity one. Again it has notes of Pineapple, but this time with Raspberry and Rose. I loved this one, and loved using it - But one time my mum said I smelt like beer. After she said that I couldn't bring myself to wear it as I began smelling the 'beer' in it. I did a bit of searching online and found that a few of you said that it smelt of beer too, so I was glad I wasn't the only one. It's shame as I really liked this, and as soon as someone disliked it I kept smelling the beer! Jingle G was released in the Winter of 2011. I was so excited to get this, and I wasn't disappointed. This is my number 1 Harajuku Lovers fragrance. This is described as a 'white floral' fragrance, but I believe it's more fruitier than that. This to me smells yummy, and smells warm too. It's definitely a winter fragrance, and reminds me of spiced fruit. You can really smell the Tangerine and Vanilla in this, and it smells gorgeous. There is a lot of floral notes in this but I can't smell them at all. If you like a fruity smelling perfume that isn't too overpowering, then I recommend this. It's gorgeous! Music is a very floral based perfume with hints of fruit. I can really smell the Musk and Sweet Pea in this that have been sweetened with Pear. I'm not a massive fan of musky smelling perfumes so I'm not 100% with this. But if you like musk with a twist, then you'll go crazy for this. Again, this is another one that doesn't last that long on the skin, which of course is a disappointment. G Snow Bunnies is a perfume full of Coconut. Most of the 'G' perfumes have a statement smell of Coconut. All I can really smell in this perfume is a more sweetened smell of Coconut. I'm not usually wild about Coconut, but this smells gorgeous. Again this reminds me of a cocktail, but I think all the perfumes do one way or another. Even though this was made for the Winter, because of the coconut smell I wear it more during the Summer. If you love Coconut, stick to a perfume labeled 'G'. Love Sunshine Cuties has a gorgeous bottle. 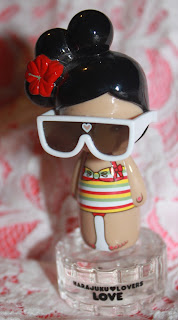 Admittedly I bought this purely because it had sunglasses! So easy amused. Of all of the collection this of all reminds me of a cocktail. However I do like this as it really fits in with the beach theme. I can really smell Coconut again in this one, and hints of Passion Fruit. There's also a slight powdery element to this which is delivered by the Frangipani and Lemon Blossom. This truly is a Summer scent. Baby Sunshine Cuties has a very distinctive smell - Sunflowers. Again this is true to the Summer theme which I love. It smells sweet of Lemons and Poppy. I can also smell musk in this too, but the Sunflower scent softens that. This is another floral scent, and if you love Sunflower you will love this so much. Overall I love the whole lot of the Harajuku Lovers Perfumes and so sad that they're not available in most stores on the high street as they used to be. What one is your favourite? Have you ever tried or bought any of these? Thank you so much for reading! Do u wanna follow each? How about following each other? If yes, please let me know. Have a nice day! Thank you so much!! Ah I love them, they're so pretty!